We offer a variety of VGA Splitters enabling you to cover a range of training, exhibition and demonstration applications. 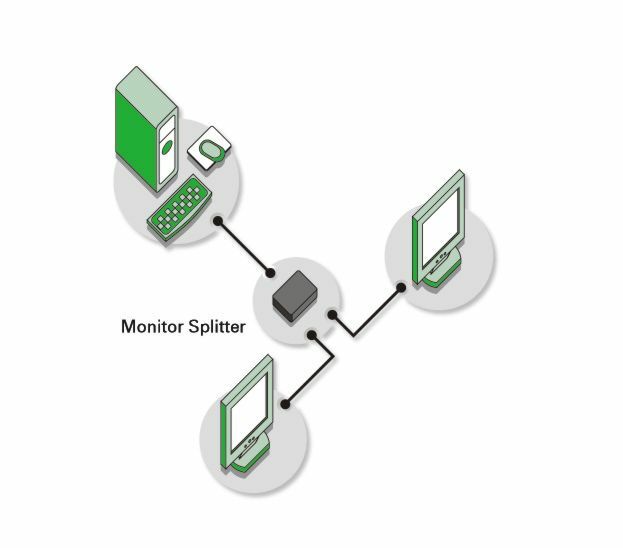 Simply connect the Splitter (with the cable provided) to your CPU, and the display Monitors can either be connected dirtectly to the Splitter or can be located up to 50 Meters away using extention leads. Our molded triple coax video cables ensure a high quality image. The Micro Splitter is a high bandwidth Splitter specially designed to work with LCD monitors and video projectors where quality is a priority. The Daxten VGA Splitter has simply be connected to the CPUs, the local monitor and each remote monitors up tp a distance of 100m (328ft). To ensure the highest video quality at high resolutions and over distances, our extensions are fully molded, triple coax video cable. Our VGA Splitters are independent of all PC operating systems and compatible with any 15 pin monitor (VGA, SVGA, XVGA). 2 and 4 port models support resolutions up to 1600 x 1280, 8 port models up to 1280 x 1024.